According to French author Henri B. Stendhal, "Since I am a man, my heart is three or four times less sensitive, because I have three or four times as much power of reason and experience of the world — a thing which you women call hard-heartedness." Stendhal may have been more astute than even he knew. Poets, politicians and psychologists have often argued that women's hearts were fundamentally different from men's, women being the more "sensitive." And while they were referring only to emotions, scientists have recently uncovered gender differences showing women's hearts are indeed more sensitive to certain factors, such as stress. In the vast majority of cardiovascular diseases (CVDs), there are well-described differences between women and men in epidemiology, pathophysiology, clinical manifestations, effects of therapy and outcomes. Emerging evidence suggests young women are especially vulnerable to the negative effects of stress on the heart, which may result in earlier onset of heart disease or more negative health outcomes if the disease is already present. For example, CVDs in women and in men over age 45 are the most frequent cause of death in Austria. Every year, 47 percent of the women and 38 percent of the men die from cardiovascular disorders. Known risk factors, such as smoking, increased blood fats, low HDL cholesterol, high blood pressure, diabetes, stomach fat, and lack of exercise are responsible for the increased mortality rate. Most of those have a much more dramatic effect in women than in men. This is exacerbated by gender-specific risks such as irregular menstrual cycles, early menopause, pregnancy complications (i.e. gestational diabetes or pre-eclampsia) and the pill or hormone replacement therapies. 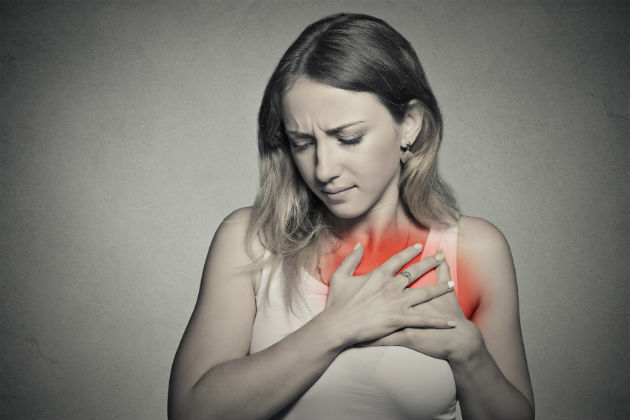 Diabetes is often an underlying condition for women with CVDs, which significantly increases the risk of a heart attack than in the case of men. Following menopause, blood pressure generally increases, and blood fats and body fat distribution are often subject to adverse changes, also increasing the risk. Women have different risk factors than men. According to Alexandra Kautzky-Willer, professor for gender medicine of MedUni Vienna, women have a different age distribution along with other clusters of risk factors, and the vascular changes in the heart also differ morphologically. Furthermore, the diagnosis and therapy are often more difficult. Examinations such as ECG or ergometry are less conclusive. Even the heart attack blood markers in women could be improved with new, specific limit values, and new gender-specific biomarkers could be established. In case of acute coronary syndrome, women often suffer from a nonobstructive, functional coronary artery disorder and, in cardiac failure, a dysfunction of the filling function of the heart at preserved output performance in comparison with men. The long-term results for both forms of illness have slightly improved, but few studies and guidelines for treatment are available. To that point, more outpatient rehabilitation services would be beneficial for women who often disregard taking time to rehabilitate after operations or illnesses for fear of neglecting their families or jobs. Psychosocial stress on the health of women's hearts is a more serious threat than previously thought. The multiple stress factors related to job, household and care of family members cause stress symptoms, which may manifest organically in the heart. For acute relief, Kautzky-Willer recommends women incorporate periods of rest in the daily routine and get enough exercise to alleviate stress. Studies revealed women benefit from relaxation therapies, such as massages. Medication has a greater effect in women than in men. For an impending heart attack, physicians may prescribe a statin drug to reduce cholesterol and prevent risky vascular calcification. Women achieve the target LDL cholesterol levels less frequently and often tolerate this medication to a lesser extent than men. According to Kautzky-Willer, an antibody-based medication in a class that was approved in Europe only last year — PCSK9 inhibitors — could provide a remedy. Although statins prevent the development of LDL cholesterol by blocking a necessary protein, PCSK9 inhibitors stimulate liver cells to increasingly remove LDL from the blood. The medication has to be administered subcutaneously on a regular basis. There is growing recognition of the importance of emotional stress as a risk factor for heart disease. Compared to men, women have higher levels of psychological risk factors such as early life adversity, post-traumatic stress disorder and depression. In addition, women are more prone to develop mental problems as a result of stress. Emotional or psychological stress potentially contributes to heart disease in many ways, from influencing heart disease risk factors, to affecting the development of atherosclerosis to triggering heart attacks. Such stress may impair the recovery, future health and quality of life of patients who have already developed the disease.